WHEELING, W.Va. — West Virginia Gov. Jim Justice last year witnessed severe and fatal flooding in the southern part of the state. On Sunday, he told those working to recover from last week’s flooding in the Northern Panhandle not to do it alone. West Virginia Gov. 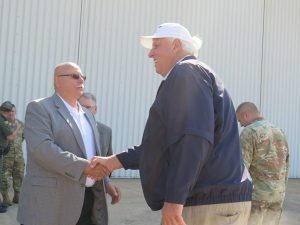 Jim Justice, right, is greeted by Ohio County Commissioner Tim McCormick, left, at the 137th Army National Guard Assault Helicopter Battalion headquarters near the Wheeling-Ohio County Airport on Sunday. “You can work yourself into a complete hizzy trying to work 22 hours a day and neglect your health and everything else, then have to deal with other catastrophes,” Justice said during a stop at the McMechen Volunteer Fire Department. “Do all and everything you can do, and let your heart lead you in every way, and do everything under the sun. Justice on Saturday declared a state of emergency for Ohio, Marshall, Wetzel, Marion, Monongalia, Harrison, Taylor and Tucker counties in response to last week’s flooding. Justice said the flooding brought back memories of the devastating June 2016 floods in the southern part of the state. He said it was wonderful that the community was able to recover within a year, and that a golf tournament at his Greenbrier Resort was able to take place and be successful. “But I just couldn’t get past it,” he said of the memories of last year’s floods. “Every time I would go anywhere, all I could think of was all those who lost everything — and the bodies we recovered out on the golf courses. Prior to his visit to McMechen, Justice was briefed Sunday on flooding in Ohio County after landing at the 137th Army National Guard Assault Helicopter Battalion headquarters near the Wheeling-Ohio County Airport. County Emergency Management Agency Director Lou Vargo told Justice that Ohio County had two flash floods last week. Most storms come into the area from the west, while the storms on July 23 and Friday came from the east, Vargo said. He estimates a storm cell over Ohio County on July 23 dumped three inches of rain in 36 minutes in the Woodsdale and Edgwood areas. The storm on Friday, meanwhile, was more widespread to the Valley Grove and Elm Grove areas, and affected about 100 houses in Wheeling and another 25 within the county, according to Vargo. There was no major damage, though there was reported basement flooding. There was about $250,000 in infrastructure damage throughout the county, as well as another $100,000 to schools, according to Vargo. Gabe Wells, communications coordinator for Ohio County Schools, said the damage occurred at Steenrod Elementary School, Bridge Street Middle School and Wheeling Park High School. School district officials are still determining the costs of the damage. Justice told Vargo to expect the actual cost to be far above estimates once they are tallied. Major Gen. Jim Hoyer, adjutant general of the West Virginia National Guard, said he and Justice have been touring the eight counties that experienced flooding this week. Hoyer said about 80 guard members were involved in assisting with flood clean up efforts in the region. The primary mission of the guard now is to gather data for the state to submit to the FEMA to determine if the state meets the threshold requirements for federal flood assistance. Hoyer and Justice had thought there had been no fatalities from the flood, but Vargo informed them there had been two deaths during the July 23 flooding in Ohio County. Michael Grow, 24, and Page Gellner, 19, were swept away by floodwater into Browns Run. Grow died at a local hospital after being pulled from the water. Gellner’s body was found early Saturday morning in the Ohio River in Wheeling. Justice said he knows how hard crews worked to recover the bodies in the flood waters. He referenced a similar situation in Greenbrier County last year, where it took six weeks to find the body of a teenage girl. “I hate like crazy we’re here,” Justice said. “All of us remember the devastation that we faced last June. It was the worst thing I’ve ever been through in my life. … You surely don’t want to lose a loved one — that’s a dimension beyond belief. But it’s gut-wrenching to think you lose your possessions that are all your memories. That was one of the most painful things for me to see. He had a great amount of praise for the members of the West Virginia National Guard and the work they did last year in the southern part of the state.